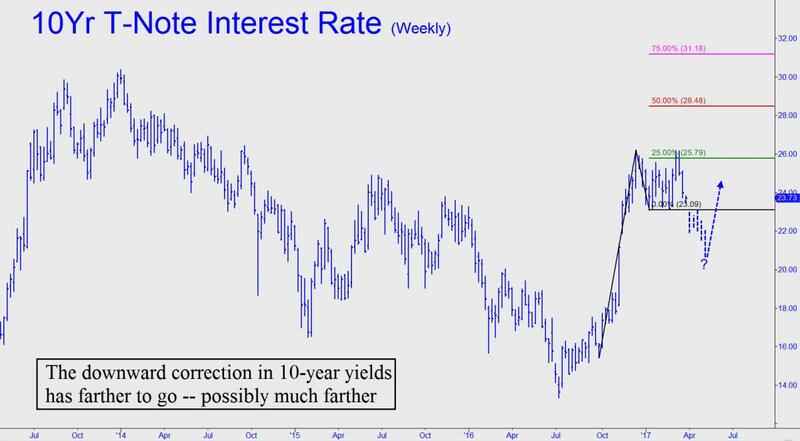 Although interest rates on the 10-Year Note have receded sharply over the last two weeks, from 2.62% to 2.35%, the chart makes clear that the pullback is merely corrective. That is not to say yields could not continue to fall significantly lower in the weeks ahead, perhaps by enough to bring mortgage rates down from the danger zone. I won’t make any immediate predictions because it will take at least four to six weeks before we can know with any confidence whether the upward skew in yields across the curve since last July, along with the reflation trade, is about to succumb to gravity. What kind of ‘gravity’? What kind of ‘gravity’? Here I am referring to the drag of an economy that has almost surely seen a peak in real estate and auto sales. And we needn’t even consider the Fed’s rosy employment picture, since it is based on statistical fraud. As for the ‘Trump rally, its rationale took a potentially fatal body blow with Congress’ failure last week to repeal Obamacare. Bottom line: Expect the downward correction in long-term rates to continue well into April.